Happy to have a new story, “Your Hysterical Wife,” in the Catamaran Literary Reader. Thanks to Catamaran for nominating it for a 2018 Pushcart Prize! Here’s a link to read it online. 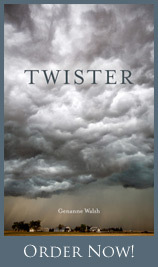 I’m delighted that BLP nominated the opening chapter of Twister for The Pushcart Prize. Find a link to read the nominees’ excerpts here. Red Earth Review has published a chapter from Twister. Read the opening pages of Twister. Spry Literary Journal asked past contributors to write short essays for an ABC’s of Fiction Writing series. My contribution includes discussion of Joseph Cornell, crab eyeballs, an interesting dream I once had, and some thoughts about paying attention. Fortune Tellers was inspired by the New Year’s tradition of prognostication. Certain experts can always be counted on to tell us what will happen in the year to come—politically, economically, romantically, you name it.